The frozen strawberry margarita is a very sweet drink. 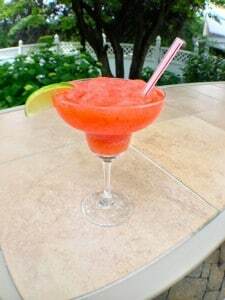 If you’re sitting by the pool and plan on having margaritas all day long, then I do not recommend the strawberry margarita. It’s a giant headache waiting to happen. The best way to enjoy one of these delicious drinks is to avoid over indulging and have only one or two. For this recipe, throw out the best margarita ratio of 3:2:1. You want to use 1 part triple sec, 2 parts tequila, 2 parts lime juice. Next you’ll want to add about 4-5 large strawberries to the blender (or your margarita machine). One last optional ingredient is a tablespoon of agave syrup. A great variation of this drink would including making a strawberry simple syrup where you boil down pureed strawberries in a sugar and water mixture. If you have time, definitely give it a try. You’ll also avoid the strawberry seeds in your drinks that you get when using a blender. So as usual, if you would like a better drink, it will take more time to do the prep work. Enjoy! Margarita Week is coming to a close. I have about three more recipes that I’d like to share but I may save them for another time. Plus, I feel like I’m neglecting the DIY and gardening posts that I want to write. Perhaps I’ll sneak a few extra post in this week. Stay tuned.